So last time I promised to talk about my theories on where many of our historical misconceptions came from, and what else besides brooches is not as big as we might think it is. I was chatting with a friend about some of the common misconceptions that I find in the general public about the size and quantity of jewelry in pre-1600’s Europe. She blamed a lot of it on the Victorians, and I agree. The upsurge in nationalistic pride combined with the romanticization of historical and mythological events in literature. Then you add some extremely talented artists who published romantic photographs and paintings of these events, and you have a perfect storm. There is something about seeing a picture that reinforces the reality of a theory, even if the theory is wrong. All of these things served to make people believe that these fantasies were fact. This article is an excellent example of the type of romantic photography that reinforced these beliefs. And this article, about the infamous forgers, Billy and Charlie, gives us another peek into the world of the Victorians and how gullible they could be. I have personally seen some of the work that Billy and Charlie did. The Victoria and Albert Museum in London, England, has a case of Billy and Charlie originals in their “Fakes and Forgeries” Gallery. Their work really was awful: crudely made, overly large, cast pieces, that bear very little resemblance to real historical artifacts. One of the problems for modern reenactors is that some of this Victorian gullibility has been retained in modern culture. Less than authentic costuming is used in movies, TV programs, and literature and many modern people’s first introduction to anything “historical” is a local Renn Faire. And every time we see a picture it reinforces the “reality” of the costumes, even if they are really incorrect. Another friend noted that one of the MOST annoying things that she sees all the time among historical reenactors is the use of a simple ring as a belt buckle. She felt that this was a Renn Faire affectation. I agree with her assessment. Pre-1600 people definitely did sometimes tie a knot in a belt, but I have never found an example of a simple ring buckle in any historical drawing or painting. These pictures show the Renn Faire Version on the left and a modern interpretation of the correct historical technique on the right. We have science and research capabilities that are very far beyond the abilities of the Victorians, but yet we sometimes choose to believe their words instead of doing our own work. So exactly how do we fill some of our knowledge gaps? Well, honestly the easiest thing is to just look at the real facts. We have thousands of illuminations and paintings that were created during the Medieval timeframe that show Medieval people at work and play. We have thousands of surviving artifacts from graveyards and other archaeological excavations that can be precisely dated and give us an accurate image of what people actually owned and used. With more and more museums digitizing their artifact collections it is no longer necessary to have large numbers of expensive research books, we can now go online and see up-close pictures of accurately photographed artifacts and art work. One of the things that I noticed when I first actually handled the pre-1600 artifacts that I own was the extremes that they would go to make it LOOK like the piece was solid and thick. The biggest tricks that were used involved carefully cast, or formed, pieces of metal, that were riveted together to create hollow structures. Even if a buckle or belt end looks very solid, like the belt end form that was common to both my husband’s belt and one of the artifacts, the originals were actually hollow. This set of pictures compares my hubby’s belt end, on the left, to the period belt end. The graphic overlay on the right picture shows some common options for the inside piece of the belt end. Remember, the artifact belt end is actually a sandwich of three pieces of metal, two exterior pieces and a center cast piece. The most common form that I have seen for this central piece of metal is a combination of the blue and green areas, but I have also seen larger belt ends with the green portion of the cast piece removed. In either case having the center of the belt end hollow uses a lot less metal, and also makes the belt end lighter. 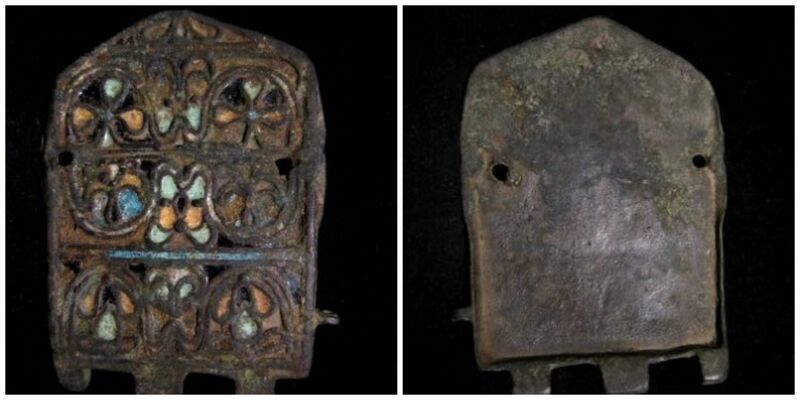 This chunky looking Byzantine buckle front may look heavy, but as the picture on the right shows, it is actually hollow. The back plate is missing, and would have had a hook to actually close the belt. Another square belt buckle fitting that I have is actually a carefully cast hollow form. The leather belt fills the entire inside of the hollow belt, and the metal is carefully riveted to the leather. The metal wraps down around the sides of the leather. The only way to tell that the belt buckle fitting is hollow is to turn it over and look at the back – a perfect fake heavy buckle. Going back to manufacturing techniques, one of the most common differences between pre-1600 belt fittings and modern ones is that many of the modern versions of belt fittings are soldered. 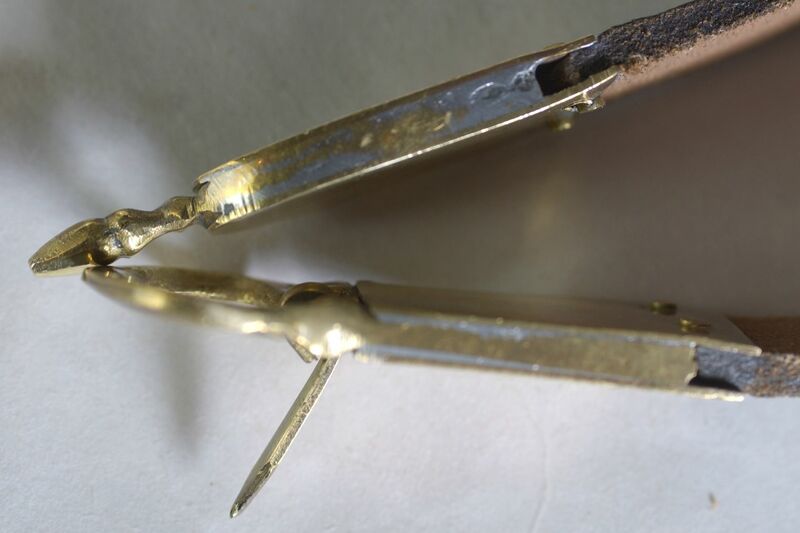 Soldering was NOT common for non-precious metals on jewelry and accessories that were made prior to 1600. They did not have all of the fancy matching solders that we have today. And they certainly did not have oxy-propane torches. Precious metals, like gold and fine silver can be fused, either in a furnace or soldered with a lamp and a blow-pipe, but base metals were generally riveted. Precious metals have different properties – they can be spot heated, but with base metals you have to heat the entire piece in order to solder them. So what are my theories on where these misconceptions came from, and what else is not as big as we might think? We will talk about that next time!